Vapor King is a well-established company that is recognized for the high quality of their e-cigarettes. Their products stand out for their appealing design and innovative technologies such as eTank and Storm which allow users to enjoy extraordinary vapour production. While their website and packaging may not be as visually impressive as other brands, the strength of Vapor King lies in their aim to constantly improve their products, offering convenience and a remarkable vaping experience. They offer a wide selection of accessories and options making them a great solution for experienced e-cigarette users. Vapor King offers all the great features you would want on your e-cig from clearomizer tanks to more advanced eGo pens, all with great performance and value. It seems they are less known on the market as some other brands but have slowly grown to be recognized with an extensive flavor collection. While the majority of e-cigarette brands are using the two piece system that combines the cartridge and the atomizer in one single part, Vapor King’s eTank works with a three piece model consisting of a battery, an atomizer and a cartridge. Even though many users prefer the simplicity of only having to put two pieces together, the truth is that Vapor King products are designed to ensure that they are easy to use and that the vapour production is solid and can even be adjusted. If you choose their eTank technology you will see that refilling the cartridges is a very simple process and that the flavour is clean and intense. The experience will justify the extra effort of putting the pieces together. Furthermore, they also offer pre-filled cartridges which simply need to be attached to the unit making things even simpler. Along with eTank Vapor King has developed another innovative technology named clearomizer. Clearomizer is designed to offer the maximum amount of vapour and has become quite popular since its release. Recently, this piece was added to their Storm kits, meaning that Storm users can enjoy the convenience of this piece which combines the cartridge and the atomizer. 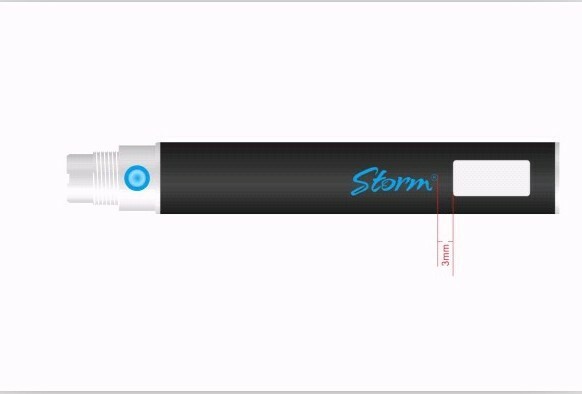 Storm has a modern and transparent design that allows users to enjoy their vaping with style. In terms of battery life Vapor King is second to none sporting several grades of battery ranging from 650 Mah all the way to 1100 Mah! 1100 is absolutely monstrous in the e-cig world. The high capacity battery provides a long lasting experience and some even feature an LCD screen which display the current battery power and how many puffs you’ve taken since your last refill! 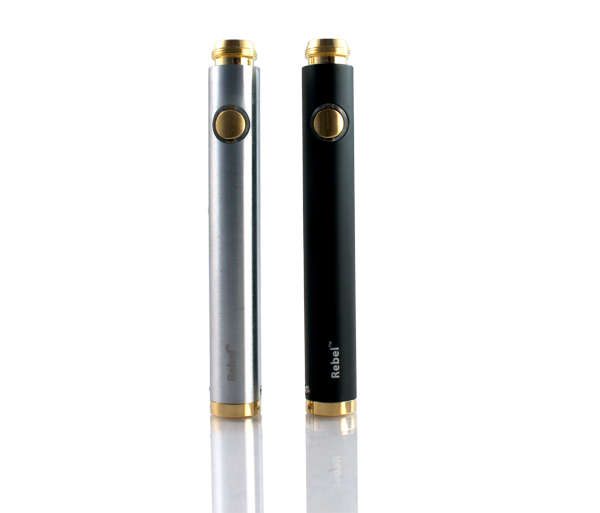 The extra power ensures you can enjoy the flavour and a thick cloud of vapour when other batteries would have failed. The batteries are available in manual and automatic and in the colours metallic blue, pink, metallic red, white, black, and stainless steel. For those of you confused about Manual or Automatic, manual features a button on the side which you press whenever you want to puff; this affords you more control over the puff you’re getting and can be tailored to your preference. Automatic simply starts working when you start puffing and does more to complete the illusion that you’re actually smoking a cigarette. Each have their pros and cons, if possible I recommend you try both and figure out which you prefer as it’s very subjective. Vapor King has spent a lot of time creating and perfecting their new technologies; this is what has kept them in the leaders pack among e-cig providers. Nowhere is there hard work more evident than in the vapor their products are able to produce. 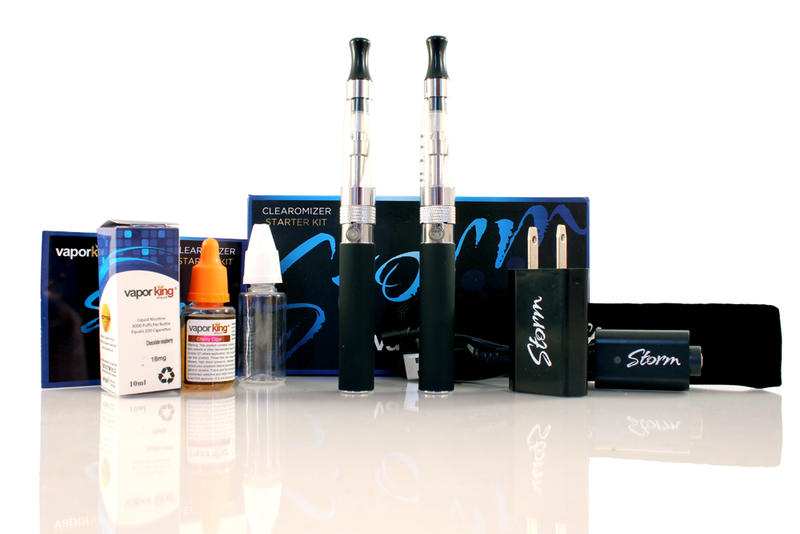 The vapour production is impressive, particularly with the Storm kit which features their clearomizer technology. Puffs are thick, luxurious, and satisfying; even for seasoned smokers which makes it the ideal first product for those who have recently quit. Not to be outdone, the eTank technology allows for a cleaner and richer flavour, making the vaping highly enjoyable particularly for the newcomers. This kit would be nice for the casual vaper who is in it more for the enjoyment of the flavors than to substitute tobacco. All in all, you’ll find that vapor king has everything needed to appeal to vapers both new and old. Vapor King offers an outstanding variety of flavours in their high quality e-juices. There are over 30 options to choose from, with additional special selections available. They continue adding new flavours and improving their tobacco options to ensure that they closely resemble some of the most popular brands. Their fruit options include Blueberry, Melon, Banana, Cherry, Grapefruit, Cranberry, and Apple; as well as great dessert alternatives such as Cheesecake, Pancake, Cotton Candy, Caramel Mocha along with traditional sweet choices such as Vanilla, and Chocolate. They also offer fun options like Champagne, Rootbeer float, and Pina colada; all of which are perfect to enjoy during a night out. One of the key factors that keep customers going back other than product quality, is Vapor King’s competitive pricing. The starter kits start very low and even the most expensive one often costs almost half of it’s competitor’s comparable kits. Vapor King has a few models and starter kits to pick from. We cover them one by one on our Vapor King Starter Kits page if you would like to have a more detailed look at each one. The most basic option that Vapor King offers is the eTank Express Kit, which costs $19.95. This kit includes one rechargeable lithium battery, one atomizer, one USB charger, and five cartridges either empty or prefilled with your preferred strength and flavour. This option is ideal for new users and for those that want to try Vapor King before committing to more comprehensive kit. 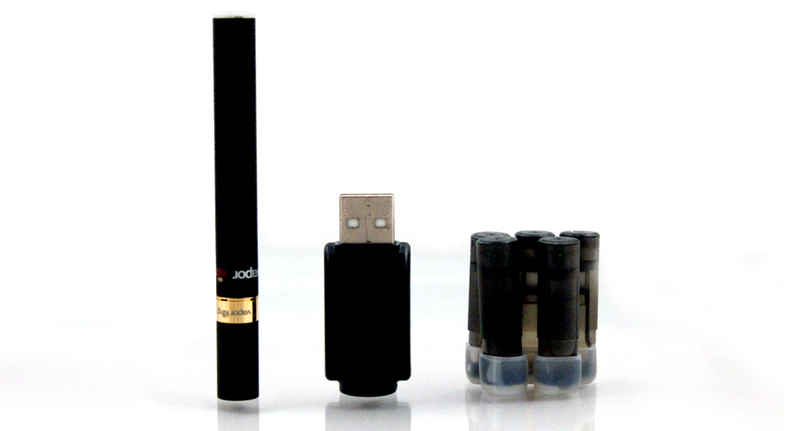 or prefilled cartridges of your chosen flavour and strength, as well as a wall adapter, and a USB charger. If you are looking for an advanced kit, then you should opt for their Ultimate kit. The Ultimate Kit contains two batteries, 2 high intensity atomizers, 25 empty or prefilled cartridges of your chosen flavour and strength, three bottles of e-liquid of your choice, one luxury carrying case, one car charger, one pocket pouch, wall adapter, and USB charger. All for attractive price of $89.95. Finally you have the storm kits which add a touch of style to the vaping experience. There are two starter options for this interested in Storm. The first one is the Storm 3.0 Clearomizer Express kit ($39.95), which includes one lithium rechargeable battery (black or steel), one clearomizer (available in blue, yellow, red, pink, green, black and white), one bottle of e-liquid of your preferred flavour, one USB charger, and one wall adapter. If you want additional accessories and options, go for their Ultimate kit which includes two batteries, one high capacity battery with LCD screen, three clearomizers, two clearomizer replacement coils, three bottles of e-liquid, one USB charger, one car adapter, one wall adapter, one carrying case, one lanyard, and one carrying pouch. The price for this kit is $119.95. Vapor King will please many users thanks to their advanced technology and enjoyable flavours. Those who are new in the world of electronic cigarettes, may find their system a bit complicated to start but experienced vapers will enjoy the options and detail that the company offers in each of their products. Even though they offer a good product, the company seems to fall short when it comes to customer service, as they are not easy to reach out and the website does not offer detailed information.